"Mr. Tondop has been replaced immediately by Chief Inspector Gideon Kauke who is currently the Police Station Commander"
Amid high tensions in the Southern Province in recent days, top cop Joseph Tondop has been sidelined as the Provincial Police Commander and remains unattached until further notice. The revocation of Tondop’s appointment was announced today by Acting Commissioner of Police and Chief of Operations Jim Andrews after the governments declared a State of Emergency in the province. 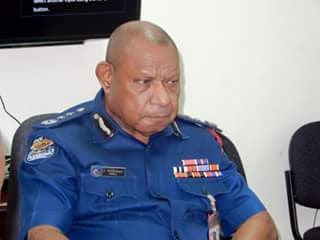 Mr. Tondop has been replaced immediately by Chief Inspector Gideon Kauke who is currently the Police Station Commander for Mendi and will now act as PPC Southern Highlands. Several other internal transfers were effected as well in line with directives from Mr. Andrews to immediately and effectively address issues in troubled SHP. Mr. Andrews said tensions were still high in the province but with the declaration of a State of Emergency and deployment of two police mobile squad who are now on the ground, order is expected to be restored immediately. “A contingent of PNGDF soldiers are on the ground as well to maintain the rule of law and another two mobile units are on standby to be sent to Southern Highlands Province should the need arise.” Andrews said. He said police are treating the events that occurred in the province as acts of violence which are criminal in nature and police will be taking appropriate and immediate actions upon all those that participated in any form of destruction to property. - Investigations, arrest and prosecution of offenders.